Romantic luxury has a colour, and it's Tiffany Blue. Nearly two centuries ago the Tiffany & Co. founder, Charles Lewis, carefully chose the hue - some say inspiration came from robin eggs, or forget-me-nots, while others claimed he was riding the popularity of turquoise jewellery favoured by Victorian brides. In any case, that tone paired with white satin ribbon and faux-diamonds instantly sets the heart a-flutter, and thus serves as the perfect way to set the mood for your wedding. 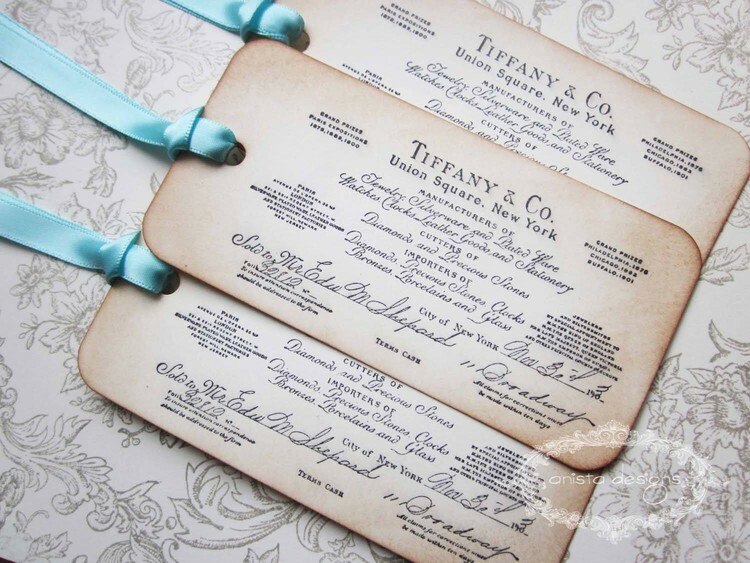 Another fun addition to our Tiffany suite of invitations is our vintage-inspired favour tags, pictured below, which reflect the strong history and tradition of the brand.